Saigon Catholics have reacted angrily with a series of mockeries and distortions against Catholics and the Church on state media, and what have happened in the nunciature and Thai Ha. 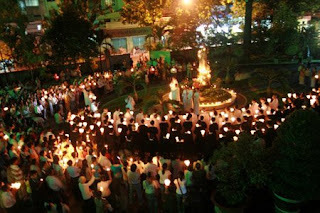 Vigils have been hold at many churches. The focal point is the church of Mother of Perpetual Help. Saigon police was in high alert on Wednesday after rumours that protests would be out broken at many Catholic sites. State agencies sent communiqué asking heads of organs to monitor closely activities of Catholic staff. In an urgent letter to all schools dated Wednesday Sep. 24, Nguyen Van Ngai, vice-director of Saigon Education Department asked principals of schools in the city to do whatever necessary “to prevent bad elements from luring students into protests against the government” due to Catholic-state tensions. “Strictly prohibit the engagement of students in demonstrations. If it the case, principals must react immediately and ask cadres to go to the site to deal with them,” Ngai ordered. “Be alert especially during the period from Sep. 24 to Sep. 28,” he added. The period “from Sep. 24 to Sep. 28” mentioned in many state communiqué raised the rumour that the government might turn to some “extreme actions” against Hanoi Catholic leadership in that time interval. Regardless prohibitions of the government and state organs, thousands of Catholics, especially students have actively participated in protests. Catholic activists estimate 5,000 to 8,000 faithful, among them at least 2000 students, attended a prayer protest at the church of Mother of Perpetual Help on Wednesday evening. The protest is seen as one of the largest protests in the city since the communists came to power in 1975. The protest began with reading a letter from Cardinal Jean Baptiste Pham Minh Man, archbishop of Saigon to all priests, religious and faithful denouncing the state media’s dishonesty. The cardinal stated that several organs of government-controlled media joined the chorus of power abuse by tailoring and taking out of context the statement made by Hanoi’s archbishop, then called into question his patriotism in an obvious attempt to deceit and incite socially negative sentiments against him and the Church. Saigon archbishop’s office has instructed that the letter of Cardinal Jean Baptiste Pham, along with the full text of Hanoi Archbishop’s statement during the meeting with People’s Committee of Hanoi, and the urgent protest letter of Hanoi archbishop’s office to the country leadership must be read at every Sunday Mass throughout the archdiocese. Attendances were presented with images of a series of attacks against Catholics, as a result of the government’s general hate campaign against the Church. Gang ransacked churches, destroyed statues and books while shouting threats against the lives of clergy and religious, Catholic faithful, and the Archbishop of Hanoi. “These acts of violence happened clearly in front of a large number of officials and police. But they did nothing to protect Catholics as these actions were attributed for ‘the fury of people’,” a priest commented. People were extremly angrily hearing warnings of the People’s Committee of Hanoi threatening legal actions against Arcchbishop Joseph Ngo; Fr. Matthew Vu Khoi Phung, superior of Thai Ha monastery; and three other Redemptorists. Protestors also could hear Fr. Matthew Vu Khoi Phung talking to them from Hanoi. Many could not hold their tear hearing the suffers of their brothers and sisters at Thai Ha and at the nunciature. Protestors asked the government to stop the media campaign against the Catholic clergy, their faithful, and the Church as a whole; stop persecutions of Catholic clergy and their faithful and leave their religious items intact; and respect its own law and return the property to its rightful owner. 220 priests from various religious orders, and parishes in Saigon concelebrated Mass with Fr Vincent Nguyen Trung Thanh, the provincial superior of the Redemptorists in Vietnam. 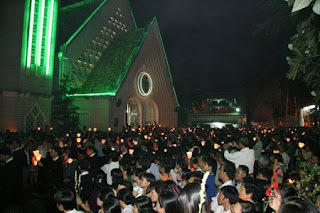 The congregation prayed for the Church in Vietnam and in particular for the faithful in Hanoi. As usual, hundreds of police were sent to the site to take photos and film with video cameras.